Created by Elisabeth Hasselbeck, Gluten-Free Mom, Emmy Award-Winning Talk Show Host, and New York Times Best-Selling Author of “The G-Free Diet” and “Deliciously G-Free,” NoGii is a line of certified gluten-free protein bars, protein powders, and paleo bars. Made from high quality and sustainably sourced premium ingredients, all products have an ideal balance of protein, fat, and carbohydrates and do not contain high fructose corn syrup, trans fats, or hydrogenated oils. NoGii offers a variety of choices to provide you and your family with good, clean, certified gluten-free, and nutritional food choices that fit your active lifestyle. I've tried protein bars and powders but something about them made me want to gag. I was so nervous trying NoGii because of my previous experiences with Protein products. Well, after trying their Chocolate Caramel Bliss Protein D'Lites I just knew I'd love everything NoGii has to offer. I love that NoGii does not contain any trans fat, hydrogenated oils, or high fructose corn syrup and is non-GMO. Their protein bars are perfect for a quick on-the-go meal between activities, refueling after a workout, or anytime you want a satisfying, protein-filled snack. I like to eat them after a workout or even during my walks. 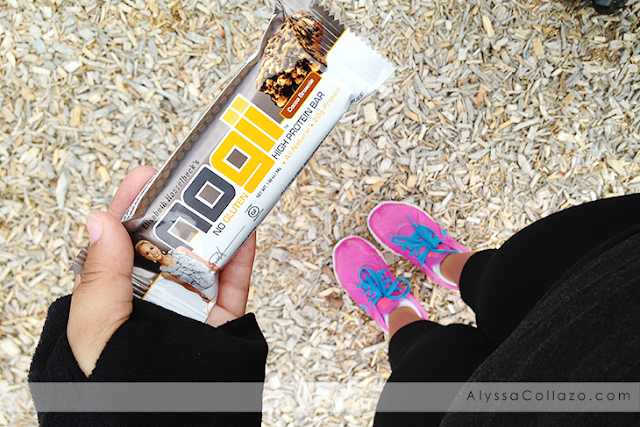 NoGii bars can be enjoyed by the entire family, and they are designed to fit your busy, healthy lifestyle. Which is amazing since I'm always on the go. If I had to pick Peanut Butter & Chocolate High Protein Bar would be my favorite. It's seriously delicious, almost tastes like a Candy Bar. This bar retails for $2.50 to $2.99 for one (1) 1.93oz bar. 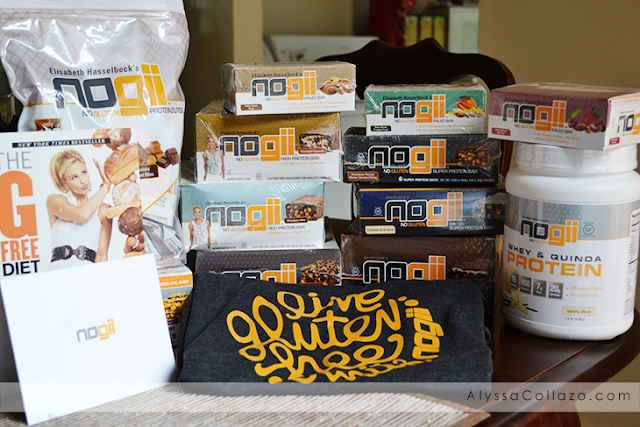 Now I got a BOX full of NoGii products and I want to share some of these delectable protein treats with you. 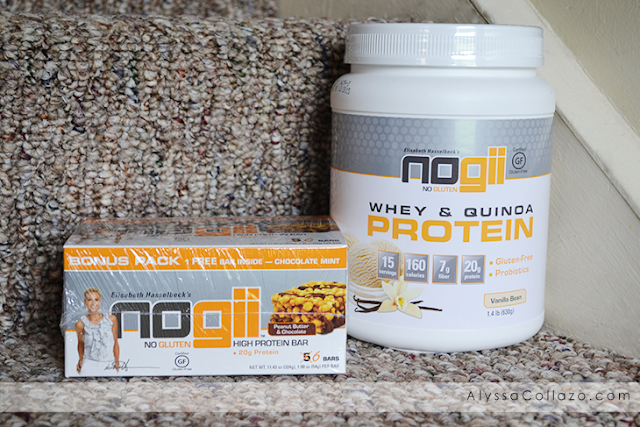 One (1) of my lucky followers will win NoGii Peanut Butter & Chocolate High Protein Bars (6 count box) AND NoGii Whey & Quinoa Protein Vanilla Bean! That's a $69.92 Value! But that's not all, I'll even include in some Chocolate Caramel Bliss Protein D'Lites. This amazing giveaway ends 07.09.15. Open to US Residents only. a Rafflecopter giveaway ENTER TO WIN - How do you incorporate healthy snacking into your lifestyle as a busy mom? Enter the NoGii TABLESETTERS Contest for a chance to win a trip to New York City, where you’ll meet and have lunch with Elisabeth Hasselbeck! To enter, visit facebook.com/nogiinogluten, look for the link for the contest, and complete the entry form. Hurry! Contest ends on July 31st, 2015. DISCLAIMER: I received this product for free from the sponsor of the Moms Meet program, May Media Group LLC, who received it directly from the manufacturer. All opinions stated are my own and are not influenced by any affiliates. I went to site and seen all the flavors, so your not just limited to the plain old strawberry, chocolate or vanilla, the best part everything is Gluten Free. I definitely do not get enough protein in my diet and I am totally with you about them making me want to gag. I will have to try these ones! I was lucky enough to try these products out too! They are delicious! My favorite is the Chocolate Coconut bar - but they are all great! Thanks for the chance to win! I like protein bars, but it wouldn't be the first thing I'd grab for a snack haha! Maybe my husband would love to win some. This is a great giveaway! I can always use extra protein in my diet. I can see how these products would be helpful for those with gluten sensitivities. It so hard and time consuming to stay healthy when you have food allergies. I'm a big fan of these high in protein snacks! This is a great review and even so an amazing giveaway, I would love to try them out. We do go through a lot of protein powder during the summer. Some gluten free, probiotic powder could be a nice change of pace! Ihaven't tried this product so it's nice to read your review. I might grab some from the store next time. I've never tried protein powder. Do you only need it if you work out a ton? I've never tried this product before. I will look for this. Love protein bars, haven't tried these yet though! Awesome giveaway. I'd love to try them, they tempting me. I've never heard of this brand before but I would like to try their protein bars, This is a awesome giveaway that I wish everyone luck in winning! These look great and when I was gluten free I tried some of Elizabeths products, they were awesome! My only problem now is my diet is so restricted it is so hard to find anything pre packaged that I can have. I wish she would partner with me to create a whole line for the diet I am on that helps people not just with celiac but with chrons, ulcerative colitis, diverticulosis, autism, and so much more. She really is an inspiration and I have read her book and watched her on television for years but until I was diagnosed with my disease I never understood until then. I really understood her struggle and felt like the message may be for gluten free specifically but everyone with a digestive disease can relate. While I am not such a big fan of her but I am glad she has brought the focus more to celiac disease and eating gluten free. I would try these products. I have never heard of this brand, but it sounds wonderful! The sad thing I probably wouldn't be able to eat it since it has whey (milk derivative) in it since I'm sensitive to it. I need to try these protein bars. I'm gluten free and finding something that is good is so hard to find. I need to do these bars as a meal supplement. Thank you for the giveaway too. I'm really interested in trying the whey and quinoa protein powder! I've never heard of this combination of protein powder before. The chocolate coconut bars appeal to me. Great giveaway, I never hear of this brand, but I am always looking for alternatives for a better protein powder. What a great giveaway! I have been hearing a lot about this brand lately and would be curious to try this protein powder as it looks like it would be very healthy! The Paleo Bar sounds super yummy! Thanks for the giveaway! The peanut butter and chocolate protein bar sounds awesome. I would love to try the Chocolate Mint bar.